← Sliding Barn Doors; My Way and Completed! It’s said you can only do things once for the first time and now I can chalk off another for my woodworking here in Phoenix. The recently completed Ocean Waves frame was the first commissioned carving piece here and now work is commencing on the first Etsy custom order! Just like the frame, this client contacted me before the shop was up and running but was willing to wait for this project. 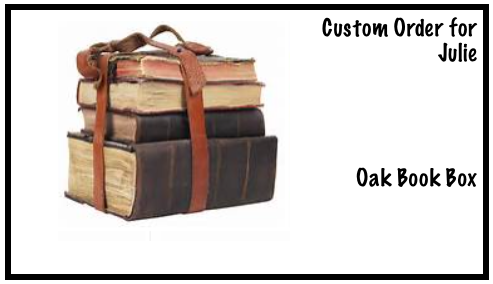 It is a good sized, finger jointed, Oak box that she will use to store hand made books. In our conversations she asked for a dark finish but, if you know me, as a general rule my work features natural oil finishes to highlight the wood rather than stained ones. That turned out to be no problem as she will do the stain work herself. After going to Woodworkers Source here in Phoenix to pick up the material work began by cutting and planing the material to size. It was more difficult than I thought it would getting the Oak in the 8″ width required but after much digging through the piles the required material was found! It has been a while since I’ve used the finger joint jig made to fit the SawStop sliding table. Truth be told, I forgot how nice it is! Through my 50+ years of working with wood many different styles of finger joint jigs have been made and used, from the simple board screwed onto the miter jig to fairly complex units that straddled both miter slots on the tablesaw. By far, this one is the most secure and easy to set up. You can see how it is made and functions through this blog link. At the time I made a YouTube video showing the jig in action. If you’ve ever cut finger joints I think you’ll see how nicely this one works. Once the jig is attached to the arm, gauge blocks are used for the initial adjustments. It took 3 trial cuts to get everything dialed in. To cut them, I use Freud’s box cutter set. To insure against a lot of tear out on the back side of the piece I always replace the backer board and make sure to hold the piece being cut tightly to the jig. As usual, the boards are marked as they’re cut to get continuous grain patterns around the corners of the box as much as possible. One of those seemingly minor details that can make a big difference. 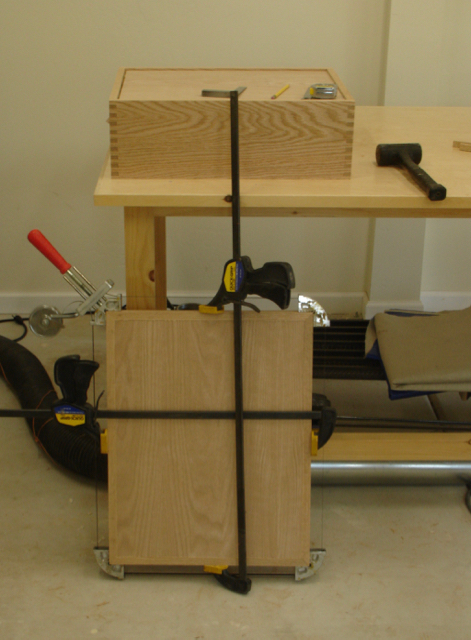 The box was clamped up to size the bottom piece which is 1/2″ Oak plywood inserted into a dado for strength. The top is a straight forward lift off one also made of the Oak plywood and then banded with a mitered piece of solid Oak. Next up is sanding the interior and gluing the pieces together and it should be ready to ship out by the middle of next week. It’s been some time since I last worked with Red Oak — forgot what a nice smell it puts into the shop while it’s being worked! This entry was posted in Etsy custom order, Finger Joint Box, SawStop Sliding Table, YouTubeVideo and tagged finger joint jig, Freud box cutter, Red oak, SawStop sliding table, SawStop tablesaw, YouTube Video. Bookmark the permalink.